The newest aircraft in the skies, the A350 is carrying its passengers from January 14th 2016. After looong 6 months, I have a finally got the opportunity to “test it” myself on a short 45min long flight from Dubai to Doha with Qatar airways. Of course, as a big fan of “everything flying”, I have to share with you my experience. But first, why is this aircraft special? New tapered wing – A350 XWB is faster and 25% more fuel efficient as a result of its wing, marking an evolution in aerodynamic design. XWB stands for “extra wide body” ( 220 inches / 564cm ) and offers maximum space and comfort, high ceilings and panoramic windows with electromechanical shades. Lower cabin pressure and optimal humidity, so you arrive refreshed to your destination. 25% lower carbon dioxide emissions than with current generation aircraft in its category. Directly after entering the airplane, you step inside of a spacious lobby which acts as a bar for business class passengers during the flight. Both, economy and business class cabin feels spacious and the seat colour theme is working well. The space is designed with smooth curves, flowing lines and straighter walls. The innovative lighting adds to the first good impression. Economy seats manufactured by well-known company Recaro are in 3-3-3 configuration. Seats look comfy and with a very generous leg-room. Unfortunately, the leg-room comes at a cost…seats are very thin, so you can imagine, the slightest screen touch of a person behind you, children’s kick or just someone trying to get out, makes the seat shake like in severe turbulence. the lady in front of me (guessing from her angry looks). Now, try to sleep on 8 hours night flight! I just can’t help it, but on a second look, the cabin and washrooms just appeals very “plastic” and somehow cheap. Also, compare to B787 Dreamliner (main competitor), which I have also flown on with Qatar Airways, the cabin is much nosier. 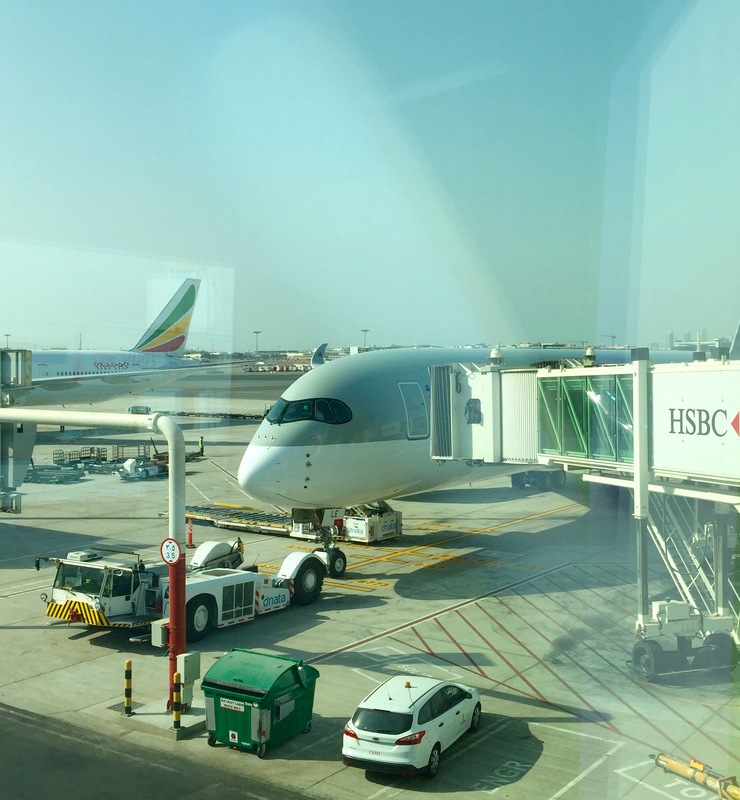 Anyhow, I was really excited to try, as A350 is the first Airbus aircraft with both fuselage and wing structures made primarily of carbon-fibre-reinforced polymer and with its distinguished black flight deck windows and tapered wings it is really unmissable machine at any airport. Previous Post: PRAGUE : Are you still looking for the ideal hotel ? Next Post: IMG WORLDS OF ADVENTURE : 147 photos from the biggest indoor Theme Park!